Did you know that 81 percent of Americans love chocolate? Whether it’s a hand-dipped chocolate or a rich cup of cocoa, there’s no question that chocolate is beloved by people all over the United States. The following are the best chocolate shops in Massachusetts. Check one or more out the next time a craving strikes. From a dark blend of drinking chocolate to intricate chocolate mice and penguins, the assortments are as delightful as the tastes at L.A. Burdick Handmade Chocolates. Each chocolate is hand-cut or shaped. Check out their chocolate elephants that that support a wildlife trust that rescues and rehabilitates these majestic creatures. Boasting chocolate prepared in the Viennese tradition, Serenade Chocolatier uses only European chocolate in their countless confections. Whether filled with fruit, nuts, nougat or cream, the aesthetic and taste are sublime. A box of chocolates from Hilliard’s Chocolates is a gift that’s not soon forgotten. Run by the Hilliard family since the early 1900s, their chocolates are well known throughout New England—and beyond. Winfrey’s started as a husband and wife team, making fudge in their basement, sold in small batches. These days it’s a highly successful shop featuring homemade fudge and several varieties of handmade fine chocolates. Check out their salt water taffy, too! Starting in his own kitchen, Frederick Hebert began making chocolates and caramels at his kitchen table in 1917. The rest, as they say, is history. Hebert Candies has enjoyed a rich history of supplying consumers with high quality chocolates and other confections in its New England stores. Fedele’s Hand Dipped Chocolates started as a family adventure in the 1970s, with Dad keeping his regular job while Mom homeschooled the kids, packed chocolates and ran the store during the day. At night they all made chocolates. Today, it’s hard to visit Plymouth or Pembroke without stopping in for a rich, decadent assortment. Made with the freshest whole ingredients, Pandolfi’s Fine Chocolates makes chocolates in small batches. A family tradition, the shop is now in the hands of its second generation. If you love imported chocolate from around the world, a visit to Beacon Hill Chocolates is a must. 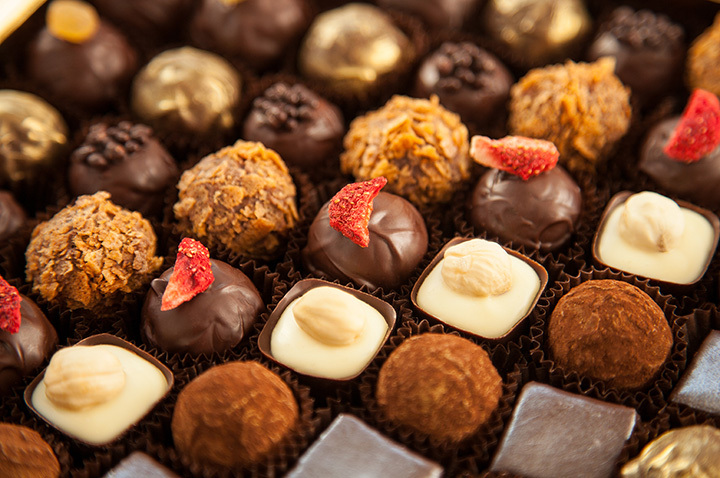 They feature small batch chocolates from several countries, including the United States. A small family-owned and operated business, Stewart’s Chocolates makes artisan chocolates, and it’s just a matter of time before they become far better known than they already are. Once you visit and taste their confections, you’ll go back again and again. You’ll be hooked on the artisanal small batch chocolates at Prides Crossing Confections. They’ve been hand made for 30 years. Their turtles and bark are local favorites.